I took a test ride on the Luggie mobility scooter at a recent Naidex show in Birmingham. As a piece of engineering I thought it was slick and well made. Extremely easy to fold down, just as easy to unfold so it can be ridden. I’m only able to compare it against the Travelscoot. Each mobility scooter has its good points and bad points. So what did I really like about the Luggie mobility scooter? The seat is comfortable and it feels stable. There is an LED display that gives an accurate indication of the remaining charge in the battery and it has a range of 12 miles. There is plenty of space for a suitcase under the seat. I like the innovative design of the Travelscoot. I never feel that I am driving a mobility scooter that is designed for the disabled. It turns on its own length There is a very useful canvas basket that really comes into its own when out shopping. The cup holders for walking sticks are a very smart afterthought. The width of the Luggie mobility scooter handlebars, are significantly less than on the Travelscoot and combined with the Luggie’s double front wheels make turning corners more difficult. Overall the Luggie is about two thirds the width of Travelscoot but it does not feel less stable. To my mind there are two factors that make the Luggie less attractive. First of all the basic model costs £800 more than the Travelscoot (this figure is dependent upon exchange rates). Also it weighs 5 Kg more than the Travelscoot. I could only just lift the Luggie, I would be unable to lift it up and put it into the boot of a car. I can easily lift the Travelscoot into a train compartment but I would need someone else to lift the Luggie onto a train. Both cost and weight are deal-breakers as far as I am concerned. The Travelscoot is a more basic mobility scooter, it is cheaper and it is lighter. The Luggie has no rough edges, has a better finish but it is not as much fun to ride. A Travelscoot is ideal for my requirements. Could you lug a luggie? The Luggie is aimed at the disability market yet none of the manufacturer’s adverts feature a disabled person. Also would a disabled person be able to pull a Luggie whilst walking with a stick, I certainly couldn’t. The Luggie looks slick and easy to use but remember the Luggie video is shot with somebody who has no obvious or visible disabilities. Call me a cynic but I know I could not pack it after use or unpack it with out falling over. Are you looking to buy or sell? If you want to buy go to Luggie or Ebay though there do not seem to be many available that are 2nd hand If you want to sell then I need more information. Description, condition email address location collection only or delivery and a photo or two. The finer details like price you can negotiate directly with the purchaser or I can publish. I have the luggie. I feel more secure in the seat. The scooters with the pole and seat plonked on top are really unstable and so uncomfortable. I tried this one out and found it to be more sturdy. It doesn’t have a stabiliser on it like my old one but honestly this one is so confortable to ride. Now I need to sort out the bus pass issue! Another thing is SPACE. So much space. CONS. I was driving up a curb and the front of the scooter lifted up and so I ended up doing a wheelie. Panic or what. But is has a roll back system so I assume that would have put me back on the ground again. Pleased you like the Luggie but I’m very happy with the Travelscoot. All the mobility scooters have their individual pros and cons. When going up a steep slope you must lean forward. Imagine you are riding a horse. The rule is to keep the body vertical. I hadn’t realised that the comments were being posted, but was irritatated to keep finding the comment page kept self-cancelling, so started again. One matter that I wished to raise is security. These scooters are valuable and are worth stealing, while you are inside a shop. What security measures are available please. Locks? Keys? Immobilisers? You will be lucky to buy a 2nd hand lightweight mobility scooter it will weigh less than 25 kg. The vast majority will have a wetcell battery and weight 50 kg or more. Out of interest why did Which only give the Luggiw 50% approval? Thank you all for your comments. These scooters are very much more expensive than I had expected. The Luggie Elite which I had thought of buying is the price of a good s/h car. The alternative must be to look at the s/h scooter market, and to see what is available. I am interested to read the comments about these Mobility scooters. I was interested in the Luggie having seen it used while I was on a cruise. The owner was delighted with it. I referred to “WHICH” and was surprised that they only gave the Luggie a 50% rating. I investigated the Luggie via the Internet, and was somewhat put back by the prices, even of a basic model. The prices of the Elite etc could buy a good s/h car. Where to now? Normal scooters are very large and would be difficult to use inside a home. Pleased to real user reviews for a change. I used a Luggie for a year but had to exchange it for TGA Eclipse due to stability issues. The Luggie toppled over twice! The Eclipse is great but impossible to assemble unless you have two free hands and good balance. Also, the weight at 45 kgs doesn’t help either. Going to check out the Drive Easy Move Foldable scooter today, hopefully it will have the right balance between portability and stability. I agree that stability can be a problem with the light weight mobility scooters because they only have three wheels. I do not have a problem with toppling over but I have learned where potential problems can exist. The advantage of Luggie etc is that they use a Lithium Ion (Dry Cell) battery that only weighs a couple of kilo. As soon as you hit 4 wheels the weight goes up and the same with a wet-cell battery. Also storing the larger scooters is another problem as well. I can ride my Travelscoot into the house and it lives in an unused corner of the kitchen diner. Have you thought of the small electric wheelchairs like the Zinger? Not tried one but read enthusiastic reports. Local Mobility UK (who are the suppliers of the Luggie) have declined to offer any dort of refund, so I am in the process of taking them through arbitration and possibly to court. Overall a right bunch of unprofessional people with shocking customer service and only intrested in taking money from elderly people and hitting their sales targets!!! DO NOT USE LOCAL MOBILITY UK !!!!! or LUGGIE SCOOTERS. Thus does sound very unprofessional and I am sorry to hear about this event. Lookinng to resolve the issue have you spoken to your OT re turning the step into a slope. I believe the luggie brakes are turned on until the throttle is applied so getting on and off should not be a major issue. I would suggest the services of an OT are required to give advice on the most appropiate mobility scooter. They might also help you with your claim against Luggie. I have to agree with your comment about suppliers of equipment to disabled people are often more interested in profit than sellig the correct equipmennt. Brought a luggie for my husband to use on our holidays. Caravan sites with our caravan. This sort of things makes me spit. A lightweight mobiliy scooter has small wheels so it is only suitable for relatively even and fairly flat surfces. Gravel, wet grass, puddles, uneven surface etc. all is a definite no-no for any mobility scooter with small wheels. Siggest you get the salesman to visit the caravan site. You need something with big wheels. It might be worth thinkng about the Di Blassi http://www.aid4disabled.com/di-blasi-r30-folding-mobility-scooter/. Never tried it out but it might be a bit more suitable. I suspect it is difficult to lift and carry around. Had a Mobie for 18 months Front wheel fell off after two weeks use.front axle buckled and was replaced but has bent again .Never had more than 4 miles out of one battery and that was on the promenade in Torremolinos(very user friendly) My husband is 84 and 151/2 stone .I would not advise anyone over 10 st or with balance difficulties to buy one. Interesting story. I’ve never tried a Mobie but I have heard stories about the hinge mechanism being a bit fragile. My advice would be to ride the mobility scooter before you buy it. Also research for any stories from other users. Thanks, a very good article. I am being pressured into getting some sort of mobility aid (because of the falls I think), but one I can walk with is very important to me. I am another MS sufferer, so most of the time I would be happy using any nearby wall. When it gets hot and uttoff’s strikes a scooter could make holidays more practical. My problem is that I am fairly tall and while all the scooters give maximum weights, which I am nowhere near, they don’t give height requirements, which I generally exceed. 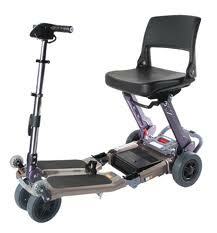 Do you know of any scooted that I can walk with which I can also fit in without pain? Is the luggie or the travel scooter a likely candidate? To give you a feel for what I mean, the limited leg room in theatres or cinemas generally gives me sore knees. I will put up with it for a time limited show, but suspect it would be a bad idea for a scooter. Am I right? Hello Rufus, You cannot really walk with have a Lugie or Travelscoot that you can hop onto when you want a ride. Thought of a rollator?. There is some room for height adjustment with a Travelscoot and there is no screen in front. I’m 6′ 0″ and Travelscoot is fine. Luggie is a much more like a typical mobility scooter and long legs might cause a problem. Luggie salesman will come to your house, Travelscoot not so easy, ring them up http://www.travelscoot.eu and ask for a reference site. I live near Watford/Aylesbury. Come back to me if you want more advice. First of all thank you for the kind comments. I bought through http://www.Travelscoot.eu, based in Munich, and was presented with the option to pay the price less the German VAT. Apologies for not stating that the lower picture is of the Mobie. The folding mechanism of the Luggie has been patented so Mobie have had to develop their own hinge. Obviously it took a bit of a battering hence the letter in the MS forum. I’ve never looked at a Mobie so I cannot comment of the strength of the hinge. A very interesting and informative article. It’s a shame that as part of the paragraph ‘It’s only a mobility scooter’ – which refers to the Luggie – the pictures inserted are of a blue ‘Mobie’ (imported by Monarch – has very similar characteristics to the Luggie, but 4 wheels, one at each corner, similar battery and weight, etc). Following some weeks of research on folding mobility scooters (mainly focussing on: Travelscoot, Luggie and Mobie), an opportunity to buy a Mobie presented itself and I hesitantly (after reading one particularly feedback on http://www.mssociety.org.uk/forum/everyday-living/light-weight-mobility-scooters) decided to buy it (May 1st 2013). I took some time to test ride and accustom myself to it… in June, our summer holidays came, and the Mobie carried me right to the plane’s doors and did much travelling (with me on it) in Turkey. Received lots of interest, comments and questions from many bemused admirers (UK airport, plane boarding staff, Turkey – holiday makers and locals alike). These so often referred to it as the ‘… your Ferrari’ that when it came to choosing a name (something I do for all my vehicles), there was no contest… DINO 1 was born. A really useful review with a number of helpful insights from the viewpoint of a disabled person. Your point about a disabled person trying to pull the luggie along behaind them or lift into a car are well made.